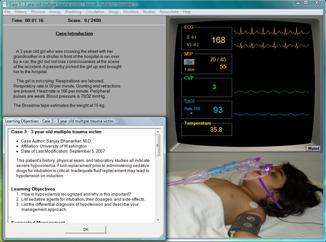 The Pediatrics Simulator is a real-time graphical simulator that reproduces pediatric patient care. Six different patients are presented and you must manage the airway, ventilation, fluids and medications to improve the simulated patient's condition. Optimize the patient's hemodynamic state with invasive monitoring and vasoactive infusions. Many emergency situations will occur requiring rapid diagnosis and proper treatment to avoid disaster. An on-line expert help system is available and an automated record-keeping system provides a detailed chart for the case. Topics cover: Septic shock, Status epilepticus,Multiple trauma, Meningitis, Near-drowning, Diabetic ketoacidosis.